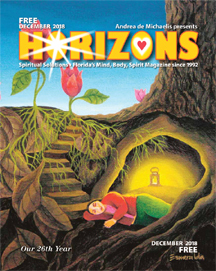 The December 2018 Horizons is now online at http://horizonsmagazine.com/mags_online/12-18-Issue.pdf . The flipbook version is at http://horizonsmagazine.com/fb/12-18/index.html. We are honored to have nationally known Maya White doing the monthly horoscopes. Maya White is a Master Destination Astrologer and one of only 90 people in the world certified in Astro*Carto*Graphy, a specialized branch of astrology which helps people find their perfect place on earth for love, prosperity, and personal growth. Visit Maya’s website and for an introduction to Maya White, see http://horizonsmagazine.com/blog/introducing-horizons-new-astrologer-maya-white/ Contact her and ask what she might do for you. Here are this month’s horoscopes: Cusp dates are accurate for 2018. Sometimes the actual date the sun enters the sign varies by a day or so because of a leap year, or, even the time of day. I assure you these cusp dates are correct for 2018. Aries – (March 20 – April 18) With Mars making moves in your solar 12th house, you may feel a bit under the weather this month. It’s just not right having your bright and brave planetary ruler in watery Pisces. Having your secret liabilities revealed is the worst part of this placement. Old physical injuries act up, and ancient unhealed emotional wounds surface, begging for release. Wisdom and temperance walk hand in hand now. Taurus – (April 19 – May 19) You’re free at last now that Venus finally has gotten her act together. Released from the woes of her lingering retrograde, Venus bides her time in Scorpio and delivers a handbasket full of rewards for you, Taurus. Ancient Eastern wisdom teaches that good things come through other people, and Venus in your relationship sector is ready to deliver. I’m talking about money, love, and happiness. Gemini – (May 20 – June 20) Work becomes much easier once Mercury stations direct on December 6th. Let the holiday season deliver more good cheer and less stress, Gemini. Your sensitive system has been under planetary assault for a while now. The good news is that Jupiter is happy and like a jolly Santa Claus, ready to bring your some goodies. Don’t overdo it, though; you still need time to recuperate. R & R is your Rx prescription. Cancer – (June 21 – July 21) It’s important to recognize that Pluto has been slowly working his way into your life. Pluto states his case in subtle (or not so subtle) ways. For example, you’ve probably gotten used to being of service to a parent or family member- never thinking about the cost. Yours is a unique relationship with family. This month, take some time for yourself. The full moon of December 22nd is in your sign – make it about YOU. Leo – (July 22 – August 22) Let this longing for freedom grow wings, Leo. You’ve paid your dues, done the right thing, and taken care of others. Now with Jupiter fanning the flames of your desire, how can you not heed his call? Here’s a little secret — this phase will come and go quickly, so take action now. The celestial dome has been home to rough and uncertain weather for several months and conditions aren’t going to get much better -– it’s time to go. Virgo – (August 23 – September 21) You may feel trapped by circumstances, but consider that there is a reason. Mars, Jupiter, and Neptune are all challenging your sign now. Nicely, it may be said that you’re building big strong existential muscles; but on the other hand, it can also feel like the world is just bearing down. The planets are putting up a strong headwind now, Virgo. Buckle down and ride out the storm. Libra – (September 22 – October 22) Love and money are always fun, and Venus in Scorpio holds the promise of both for you this month. The thing is – you are very resourceful anyway. Venus is just putting a shine on what you have naturally. Focus on being who you are and doing what you love to do. Networking is super productive, now. Remember that every person you meet is a golden link in the chain of your prosperity. Scorpio – (October 23 – November 21) Yours is another of the signs that has been plagued by rough celestial conditions over the past few months. Finally, with Mercury retrograde over on December 6th, things start to smooth out. Just take care on the 7th when Mars conjunct Neptune delivers the possibility of making a decision you’ll regret. Tune into your eagle vision, and like the tailor, you must measure twice and cut only once. Sagittarius – (November 22– December 20) Truly, Jupiter in your sign will be a bonus to every aspect of your life. Take advantage of this great year ahead. You’ve earned the freedom to explore, even if it takes some negotiation to carve out the time away. Finances are still a bear, though. With both Pluto and Saturn in your money sector, you can only bow to their demands. In some imaginary land, this discipline is good for you; at least that’s what ‘they’ say. Capricorn – (December 21 – January 18) Watch your expenses this month, Cap. There is a slippery slope out there that can all too easily cascade to a mudslide if left unchecked. For example, if you’re asked for a loan, just know that repayment will be slow and uncertain. Consider giving your advice, or your time and energy in lieu of cash. No matter what, you may end up feeling unappreciated. Tune into your heart and remember the reason for the season. Aquarius – (January 19 – February 17) Uranus is making one last, wild foray back into Aries. It’s like he just doesn’t want to leave. This makes for frustration, leaving you feeling like you’re on the edge of a precipice yet it’s not quite time to leap. It’s OK. Guess what, next January delivers two eclipses and you need more information. Valuable information comes with this slight delay. You must be patient. Pisces – (February 18 – March 19) Focus on your creativity this month, Pisces. Mars is in your sign all month, and if you play your cards right this can be a great time to get things done. It really does feel different when Mars is activated. Take care to not get into an injury prone cycle. You do have to pay attention when driving and I don’t even need to mention excessive drinking. Remember your delicate system. This entry was posted in Uncategorized on November 25, 2018 by Andrea.